Humor and whimsy are still very much a part of the Phunny Phorty tradition with some members favoring costumes inspired by current events and the peculiarities of local culture. Masked revelers gather at the streetcar barn in Uptown New Orleans for the Twelfth Night ride and get into the spirit of the event by carrying signs and banners with humorous slogans and messages. There are champagne toasts and second line dancing as the sounds of the famous Storyville Stompers New Orleans Brass Band fill the air; the Phellows, after cutting a ribbon and announcing, “It’s Carnival Time!” then board a decked-out party streetcar. While on their merry way, the Phellows and other revelers sip champagne, eat King Cake, dance and let fly with the very first beads of the Mardi Gras season. There are two King Cakes used for this phirst night phrolic, one for the female members and one for the gents. Custom dictates that whoever takes the slices containing the plastic Carnival babies are declared Queen and Boss Phellow for the year. The Krewe du Vieux is a non-profit organization dedicated to the historical and traditional concept of a Mardi Gras parade as a venue for individual creative expression and satirical comment. It is unique among all Mardi Gras parades in the city because it alone carries on the old traditions of Carnival celebrations, using decorated, hand or mule-drawn floats with satirical themes, accompanied by costumed revelers dancing in the streets to the sounds of jazzy street musicians. We believe in exposing the world to the true nature of Mardi Gras - and in exposing ourselves to the world. Though it seems like yesterday that two sisters saw in their dreams a vision of Mardi Gras, with the beauty and grace that could only be captured in an all women's carnival organization. Thus, was this krewe born. A symbol was chosen for the power, dignity and beauty of a women's krewe... The ageless splendor of Egypt's mighty ruler... Cleopatra! The Krewe of Pontchartrain, New Orleans Mardi Gras organization, parades down some of New Orleans’ most famous streets. The parade starts at 2:00 p.m. on the first Saturday of the official New Orleans Mardi Gras season. 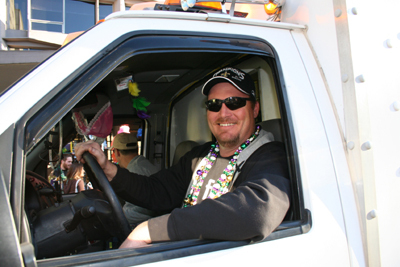 Each year the Krewe invites a celebrity to be the "Grand Marshal". Each Grand Marshal has their own specially designed cup just for the parade. Past Grand Marshals have included singer and musician Allan Toussaint, actor Red Buttons, baseball star (New Orleans’ own) Will Clark, TV Star Bart Simpson, singer Irma Thomas, Sports Commentator Jim Henderson, and last but not least, entertainer extraordinaire Becky Allen. Chief Choctaw was just a papoose back in July, 1935, when he first saw the light of day. His dues were 50 cents per month. Originally formed as a social organization, Choctaw did not parade until 1939 when ten old U.S. Government mail wagons were purchased from a salvage company for $50.00 each. The old stripped-down mail wagons formed the chassis for the first Choctaw carnival parade floats.Choctaw's organizing group were Leonard Santos, L. "Whitey" Knollman, Albert Leddy, Louis Zinc, A.P. Gary, W.N. Burmaster, Henry Klink and John Beninate. Meetings were held in the rear of the Santos Cafe, located at Slidell and Brooklyn Ave., Algiers. The original Krewe of Freret paraded for over forty years, bringing joy to the Freret neighborhood until the mid-1990′s. The original Krewe was captained by Nash Barreca, with a den located at his family’s restaurant on Freret Street, Frank’s Steakhouse. The floats would line up on Freret Street behind the Loyola Field House (now the gym/parking garage). The Krewe’s LLC expired nearly twenty years ago, before the new Krewe apopted the moniker in late 2011. Several descendants of Freret’s original ranks grace the new Krewe’s membership roll. Much like the old Krewe, the new Krewe cherishes the Freret Street mixed business and residential community. Founded in 1951 Sparta is the first Mardi Gras Parade of the New Orleans Season to present Flambeau Carriers. This New Orleans parade is very innovatavive as well as traditional. The first several parades rolled as Mecca/Sparta, after which the parade, as well as the bal masque, took on the name of The Knights of Sparta. The parade is led by the captain aboard a white stallion, and he is followed by his shadow, a young boy who also rides a white steed. Sparta annually christens the St. Charles Avenue parade route and is the first to present flambeau carriers. Sparta's membership is associated with the maritime industry. The Krewe of Pygmalion is a New Orleans Carnival Club founded in 2000 by a group of Carnival veterans who wanted to provide a high-quality parade for the first week of the Mardi Gras Season. The Krewe of Pygmalion consists of male and female riders. The Krewe of Pygmalion takes its name from the Greek legend of a Cypress king who sculpted a statue of the sea nymph Galatea. So real and beautiful was the statue to Pygmalion, he fell helplessly in love with it and spent the rest of his life adoring it. The Krewe of Carrollton was founded by a group of local businessmen in 1924, parading on Mardi Gras Day in the neighborhood of Carrollton. In 1933, when rain forced the cancellation of most of parades, including Rex, Carrollton presented the only daytime parade of the season. Following a fire in its den in 1941, and World War II, during which there was no Mardi Gras celebration, the men of Carrollton reorganized. Carrollton is now the third oldest parading krewe. One of the city's most popular parades, Carrollton starts the traditional parade season on the second Sunday before Mardi Gras. The only Mardi Gras krewe in New Orleans by and for the canine population is ready to sniff the streets of the French Quarter for the Twenty-second year on Sunday, February 22, 2014. The Mystic Krewe of Barkus is a non-profit organization founded by Wood Enterprises. The 2014 Parade will start at Armstrong Park promptly at 2pm and proceed on their traditional 15-block route through the Vieux Carré, stopping at the VIP Reviewing Stand at Good Friends Bar, corner Dauphine and St. Ann, where VIPs (and those who desire to be VIPs) will toast the Royal Court. It's a tradition in Mardi Gras that the names of the Krewes are usually after Gods or Goddesses in Greek or Roman mythology. Nyx was the Greek Goddess of night. They wanted to parade at night and be the goddesses of the streets of New Orleans during their ride. Bringing together women of diverse backgrounds and enhancing the spirit of Mardi Gras for the community is the vision for the Krewe. Embracing a little bit of tradition, with a twist of new and fun ideas, is what makes the Krewe of Nyx so special. All women are goddesses no matter what age they are. Every woman deserves to be adored, respected, and made to feel beautiful. Founded in 1939 the group has consistently turned in some of the best parades for sixty three years. At last count the group had 250 members or Knights and was still growing. True to Carnival and Masonic tradition, from which a fair number of these gentlemen come, they are very secretive in nature. Since it means a great deal to the Knights the identity if their king is never released to the general public. The exact title of Babylon's elaborate parade and ball theme are also undisclosed until the day of the event. Customarily, each float depicts a chapter in a continuing story, usually historical, classical or literary in theme. Founded in the summer months of 2000. This Krewe is made up of many other parading organizations. The identity of the King is kept secret. Throws include Chaos Coins (aluminum doubloons), theme cups, krewe-emblemed medallion beads (plastic) Official colors: blue and silver. In the early days, float creation emphasized craftsmanship, detail and story, and Hermes is known for upholding these ideals. The float parade is the culmination of a season of events which intensify on the final week. The night before the parade is the Hermes Grand Ball, where the King and His Court are presented in an elaborate ceremony, followed by a boisterous Supper Dance. And while the King is the center attraction, his identity is kept secret in keeping with tradition. VIVITE UT VEHATIS. VEHITE UT VIVATIS. Dictator's identity will never be revealed to the public. This year's Le Krewe D'etat floats will, as always, depict a satirical theme. There is a certain dedication and caring among Krewe of Morpheus members that makes Morpheus more than just a ride; rather they have become an organization that enjoys getting together several times per year. With a membership approaching 500, they invite you to join them, make friends for life that parade together down the traditional St. Charles Avenue and Canal Street route. Founded in 1917 and named for the Goddess of the Rainbow and Messenger to the Gods. The Krewe of Iris tableau ball was the first such event to ever be televised. Founded in 1969, the Krewe of Tucks is an irreverent band which began as a rag-tag group of Loyola University students. The name is taken from "Friar Tuck," a defunct uptown pub where the students decided to create their own Carnival Krewe. From a small nighttime parade of pick-up trucks, the Krewe of Tucks has since grown in size and stature to become a procession of major proportions. Tucks, however, has never lost its sense of humor, maintains an "Animal House" reputation and boasts a "no sponsorship requirement" to become a member. The Krewe Of Tucks parade ends near the Marriott Hotel, site of the Tucks Extravaganza which is open to the public by paid admission. The Ducks Of Dixieland March in the Krewe Of Tucks as a Marching group Parade each year . Several innovative “firsts” were introduced to the Mardi Gras tradition by Mid-City and the Krewe was the first to use animation in float designs (1947) and decorate their entire floats in Foil. Krewe Of Thoths Signature floats: Thoth Tomb (new), Egyptian Jesters (new), Wake up New Orleans, Here we Come (new), Thoth Magazine Line, High Priest of Thoth, The Royal Barge, His Majesty’s Entourage. The Krewe of Bacchus parade was founded in 1968 by a handful of New Orleans business leaders whose dream was to revitalize Carnival. On Sunday, February 16, 1969, the Krewe of Bacchus staged its first Mardi Gras parade. The theme was "The Best Things In Life", and the procession was led by celebrity king Danny Kaye. The 250 member, 15 float entourage took to the streets of New Orleans showering thousands of spectators with over a million strings of beads and 300,000 doubloons. The new parade was a smashing success. The Krewe of Orpheus has mesmerized the crowds who jam the streets of New Orleans awaiting its arrival. From its founding in 1993, Orpheus has consistently stunned the revelers on Lundi Gras, the night before Mardi Gras, and has exploded as the largest new Krewe in the past 30 years. Since that first ride, Orpheus has been one of the most eagerly anticipated Mardi Gras parades of the season. While the "Group" marched in Mardi Gras as early as 1901, their first appearance as Zulus came in 1909, with William Story as King. The group wore raggedy pants, and had a Jubilee-singing quartet in front of and behind King Story. His costume of "lard can" crown and "banana stalk" scepter has been well documented. The Kings following William Story, (William Crawford - 1910, Peter Williams - 1912, and Henry Harris - 1914), were similarly attired. Rex (founded 1872) is a New Orleans Carnival Krewe which stages the city's largest parade on Mardi Gras Day. Rex is Latin for "King", and Rex reigns as "The King of Carnival". Rex was organized by New Orleans business men in part to put on a spectacle in honor of the New Orleans visit of Grand Duke Alexis of Russia during the 1872 Carnival season. Also in the minds of the founders of Rex was the desire to lure tourism and business to New Orleans in the years after the American Civil War. The Rex parade is put on by an organization called The School of Design. The organization is related to the private New Orleans men's club The Boston Club. business and fellowship within St. Bernard Parish." Shangri-La began in 1973 as an all women's Krewe in St. Bernard. In the year 2000, with King Mario G. Bogran and Queen Patricia Bogran, this was the first brother and sister royal family of Shangri-La. That year the Krewe also moved to the uptown New Orleans route and has since become a club of very festive men and ladies. Shangri-La is known for its family atmosphere and the parade's 31 years of family themes reflects this important feature of the Krewe. You find many families with several generations on the same float! Bards Of Bohemia are parading in Galveston, TX and New Orleans, LA this is the 1st Mardi Gras parade krewe to be in two cities during the the same Mardi Gras season. Bards of Bohemia is an organization that has existed for more than 70 years on the Carnival scene in New Orleans, LA. 1984 Bards Of Bohemia hosted a mini parade throught the French Quarter. And in 1989 their first full parade. In 2005 Bards of Bohemia planned to stop parading, but a new captain steped forward to wrest control and the club did parade.